Steel Stromberg Carlson automatic styles were rather parallel amongst manufacterurs through the years between telephone manufacturers with automatic styling. To compete, Stromberg Carlson came out with 1243  in 1940. It was similar to the W.E. 300 except for “sawed off “ corners. It is one of the few, if not the only phone ever made of a strong.zinc alloy. This was to ward off rust. However, when subject to moisture, it produces corrosion all its own. This phone was used with & without a dial. A dial “blank” [round “plate” or disk] covered the opening where the dial would go. A magneto box was attached & when cranked, signaled the called one. 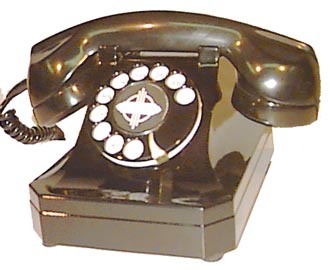 Crank phones were used in rural areas whereas dials were used in the cities. These phones were in use in rural areas until 1970. During the 1960’s, dial systems came to rural areas and these phones were replaced with the plastic 500 set with large dial. In cities where dialing was in use, a new home getting a phone would have the old line 12? Replaced in the early 50’s. In 1972 we purchased several hundred of these from an antique dealer in Tunnel City, Wisconsin for between 25 cents and $1.00 each. He had purchased several truckloads of old phones from the Ontario, Wisconsin Telephone Company. Some years prior all for one dollar, just to get the woodwall crankers. During the same months, we purchased several hundred more from an old scrap iron yard in La Crosse. Since during these years, they weren’t considered antiques yet, so we made them useful again & sold them as an ordinary phone for $2.00 to $4.00 each to many households in the area. Interest in these as a collectable or antique didn’t begin until about 1982 when after refurbishing, we sold them for around $5.00 to $7.00 each. As refurbishing and purchasing costs, and demand, increased, our asking price also increased. In the 1990’s, as with most product you pay increasingly and continuously more for overhead.